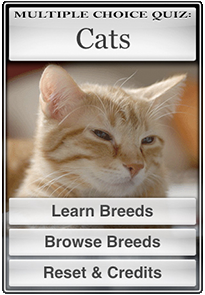 LEARN ABOUT CAT BREEDS: from common tabbies to exotic russian blue thru visual recognition. AMAZING PICTURES of a large variety of cats that inspire learning. There is no better or easier way to introduce yourself to the world of cats!